Apple has unveiled two new devices at its annual developers conference, WWDC 2017. The first new device is the iMac Pro. Apple's new desktop computer, features a magnificent 27-inch Retina 5K display, which supports a resolution of 5120 x 2880 and has 500 nits brightness. The device runs on the newly released macOS 11 High Sierra, and comes in three variants, one powered by an octa-core processor, one with a deca-core and one with an 18-core processor. Memory options on the device starts at 32GB DDR4 RAM at 2666MHz, and is configurable up to 64GB or 128GB. Storage options begins at 1TB SSD, and is configurable to 2TB or 4TB. The graphics processor on the iMac Pro is a Vega GPU Radeon Pro Vega 56 with 8GB of HBM2 memory, and is configurable to Radeon Pro Vega 64 graphics processor with 16GB of HBM2 memory. The front camera on the Apple iMac Pro is a 1080p FaceTime HD camera, which supports full resolution at 1 billion colours for the built-in display, or 2 external 5K displays @ 60Hz, or four 4K UHD 3840 x 2160 external displays at 60Hz. You can also use up up to four 4096 x 2304 4K external displays at 60Hz, with support for millions of colors. 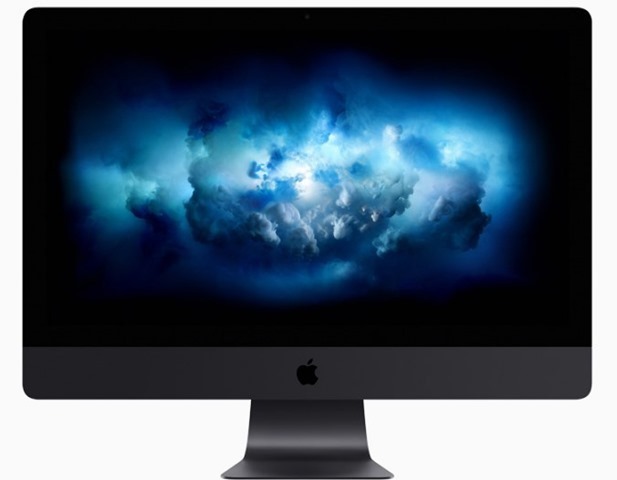 The iMac Pro supports extended desktop and video mirroring modes, has 4 Thunderbolt 3 USB Type C ports, 4 USB ports, including a DisplayPort output over USB-C VGA, HDMI, DVI, and Thunderbolt 2 output supported using adapters (sold separately). There are stereo speakers, 4 mics, and a 3.5 mm audio jack for headPhones. Connectivity options on the device includes an RJ45 port for 1Gb, 2.5Gb, 5Gb, and 10Gb Ethernet, 802.11ac Wi-Fi IEEE 802.11a/b/g/n and Bluetooth 4.2. The iMac Pro comes in a Space Gray colour, with matching Magic Keyboard with Numeric Keypad, and a Magic Mouse 2. The Apple iMac Pro prices start at $4,999, and will begin shipping in December. The new iPad pro comes in two variants: a 10.5-inch and a 12.9-inch Retina display. Both devices sport LED backlit displays, with ProMotion technology, P3 Wide Color, True Tone Display, Oleophobic coating, and an Antireflective coating. The 10.5inch display supports a resolution of 2224 x 1668 resolution at 264 pixels per inch, while the 12.9-inch display has a 2732 x 2048 resolution at 264 PPI. The tablets are powered by the iPhone 7’s 64-bit A10X Fusion chips (6-core CPU) and an embedded M10 co-processor, and a 12-core GPU. 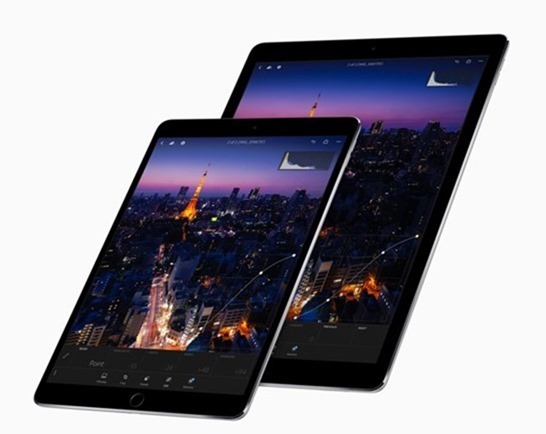 The iPad Pro 12.5 inch is the first of the tablet series to come with 4GB of RAM. The devices will run on iOS 11 which will be released this fall, and features a new Files app, customizable Dock, better multitasking, deeper integration of Apple Pencil, etc. The rear camera on the iPad Pro is a 12.0 megapixel lens, with an ƒ/1.8 aperture, 5x digital zoom, 2x Optical zoom, optical image stabilization, 6-element lens, autofocus with focus Pixels, quad-LED True Tone flash, a Sapphire crystal lens, Backside llumination sensor, Hybrid IR filter, Auto HDR, Slo‑mo video, 4K video recording at 30 fps, 1080p HD video recording at 30 fps or 60 fps and 720p HD video recording at 30 fps. The front camera is a 7 megapixel FaceTime HD camera with retina flash, 1080p HD video recording, an ƒ/2.2 aperture, Auto HDR, and BSI. There are 4 speakers for audio, and dual microphones for calls, video and audio recording. All models of the iPad Pro support Wi-Fi 802.11a/b/g/n/ac, dual band 2.4GHz and 5GHz, HT80 with MIMO, Bluetooth 4.2, Digital compass and iBeacon microlocation. Cellular models support UMTS, HSPA, HSPA+, 4G LTE, Apple SIM, Assisted GPS and GLONASS. Sensors on the device include Touch ID, Three‐axis gyro, Accelerometer, Barometer and an Ambient light sensor. The iPad Pro will be available in 64GB, 256GB and 512GB storage variants. The 10,5 inch device offers up to 9 hours of battery life, while the larger device offers up to 10 hours of battery life. The 10.5-inch iPad Pro comes in 4 colours: silver, space gray, gold and rose gold, and its prices starts at $649 for the 64GB WiFi only variant, while the 64GB Wi-Fi + Cellular model costs $779. The 12.9-inch iPad Pro is available in silver, space gray and gold and is priced at $799 for the 64GB Wi-Fi model, while the 64GB Wi-Fi + Cellular model costs $929. The new iPad Pro is available for pre-order today in the US. and will ship from next week. The devices will be available in 38 countries later this month, including Australia, Canada, China, France, Germany, Hong Kong, Italy, Japan, Netherlands, Russia, Spain, Sweden, Switzerland and the UK. India, Turkey, UA. The tablets will be available in Brazil, Mexico, South Korea and other countries in July. Apple iMac Pro and, iPad Pro announced. Here's all you need to know about the new devices. A look at what Process Lasso Pro is capable of.